This weekend's boat shows around the world include the new SailQuest Mystic in Connecticut. With spring in full swing, it is officially boating season in many parts of the country and around the world. But if you can't get out on the boat this weekend, why not do the next best thing and go to a boat show? From the new SailQuest Mystic, to Cruisers University in Balitmore, to big boat shows in Singapore and New Zealand, there just may be a boat show, yachting event, or river festival near you right now! UPDATE: This weekend's boat shows were a big success. To see photos of all the boats and sights from SailQuest Mystic at Mystic Seaport this past weekend, check out the album on our FaceBook page. SailQuest Mystic is happening this weekend, Friday May 13 through Sunday May 15, 2011. 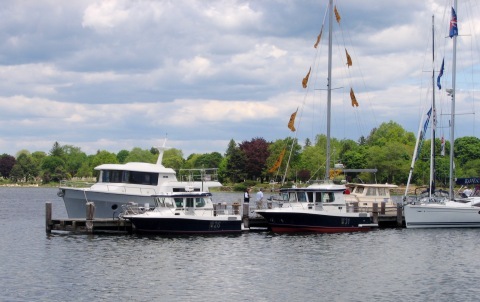 This in-water boat show is located on the grounds of historic Mystic Seaport, and despite having the word "Sail" in the name, the show features both sail and power boats, as well as plenty of boat gear. 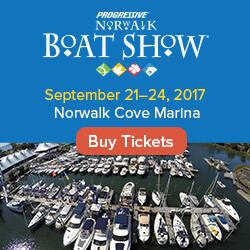 Discounted boat show tickets can be purchased online for a substantial savings - over 50% - that covers both the boat show and admission to the Seaport. For the coupon code and more information about the show, visit the SailQuest page at Windcheck Magazine's site. The Muscatine boat show in Iowa was canceled this weekend due to flooding. In case you don't believe them, their event website has some pictures to show what the Mississippi River has done to their area. 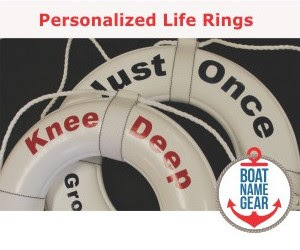 In addition to the Mystic, Connecticut, boat show, there are two major boating events this weekend in the United States. One is Cruisers University (Baltimore), which is a big weekend-long program that will provide expert instruction in a wide range of subjects pertinent to long-range cruising. The other event is something called the Cotee River Seafood Festival & Bright House Networks Boat Show, near Tampa. We'd like to tell you more about it, but we ran out of room after that long name of their boat show. Outside the US, there are some pretty big boat shows taking place this weekend. Boat Asia runs Thursday through Sunday in Singapore, as does the Hutchwilco New Zealand Boat Show in Auckland. If you're in Italy, don't miss Fano Yacht Festival 2011 in Porto Turistico. Details about these and other boating events this weekend, including links to the official show websites, are on our calendar of boat shows. If we missed an event in this article or on our calendar, please comment with details of the show, or send us an email - boatshows@firstboat.com. MarinaFest in Marina del Rey, California is this weekend, too.